Lost Maples: Fast &amp; Light by REI! 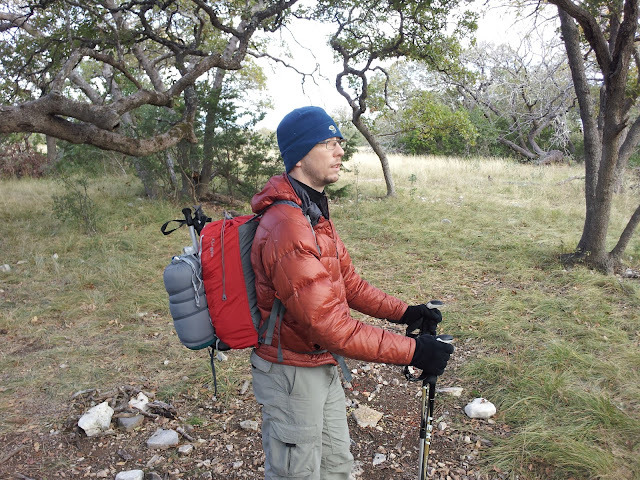 Lost Maples: Fast & Light by REI! Just to set the record straight... I work @ REI San Antonio, TX. I just recently applied for a challenge grant. The challenge grant is where you propose an idea of any type using REI equipment. Then if they determine your challenge meets the criterium, they sponsor those equipment needs. The idea us to choose REI branded equipment of Lees than or equal to $300. I proposed the following ode and equipment choices. Fast & Light winter camping! I was granted the equipment under the pretense that I would complete my challenge of hiking & camping with nothing more than basic necessities that fit in the Flash 18 pack. I will be posting an extensive review of things individually next. But for now... Here is a picture of me this morning after breakfast & coffee, heading back to the car. NOTE: None of the ideas or views expressed here are those of REI Corp. The are solely the product of my own creation. Cool. Looking forward to see what you come up with. Cool. Looking forward to hearing more about this. Just curious what kind of temperatures will you be headed into with this set-up, and what other items do you have in your kit? DO you have a gear list? How many days out will you use this on? Gear list was simple... cookpot, 2 sleeping bags, sleeping pad, bivy, monkey pillow, stool, water (5 liters), flash 18 pack... I think that was about it. Not that it matters to me anymore because I am more into the minimal part, not the weight as much. If you go minimal, then the weight will respectfully follow. I felt quick and light and used these several REI items because they were given to me on the challenge grant. If this was something I was going to do on my own... I would have chosen a few different things. I hope to get out more soon, 2 jobs, and school have been quite the deterrent in achieving as much camping as I want to be doing. Sorry if I left out too many specifics, but I am trying to get back to blogging more. Just been SOOOO busy. I feel that my being busy is payback for how much time I took off LAST YEAR!! !